This is Chriss first solo album since 1983. It consists mainly of his own fresh and melodic compositions - some exhibiting his trademark virtuosity, some a touching lyricism - but also contains some traditional pieces, including the version of Scott Skinners Mathematician with which hes been stunning live audiences for years. 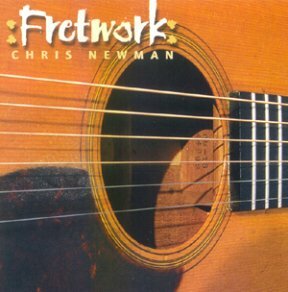 STIRRINGS "This is Fretwork, Chris Newman's new solo album, and the third one in a hopefully very long line. Here's hoping the next one doesn't take another 15 years to arrive. Chris Newman, if for some bizarre reason you have never heard of him, or worse still, not heard his playing, is one of the most amazing acoustic guitarists on the scene. He is a player of the most impeccable taste and style, a truly inspired composer whose playing is always sparkling, and this CD showcases his talents to the full. Every guitarist should have this CD. Here he plays all guitars, mandolins, piano, electric and fretless bass and percussion. He is accompanied on some tracks by Máire Ní Chathasaigh's harp, piano and tin whistle playing and the violins of Nollaig Casey. These three complement each others playing so unbelievably well and possess a synergy and interplay that makes this CD simply magic. There are 17 tracks on the CD, all instrumentals with quite a cross section of music and styles, going from a track from the Bluegrass universe of Béla Fleck and Jerry Douglas to the traditional fiddle tunes of James Scott Skinner to a Polska from Sweden to sounding classical in parts and practically everything in-between. The opening track Pass the Pick is a great tune which swings along at a fair old crack, being a 'shootout between a swing guitarist, a flatpicker and a mandolin player', (described much more aptly by Chris Newman than I could), interesting to say the least and one of my favourite tracks. Some of Chris Newman's self-penned work is present on the CD and is truly excellent as is his arranging of traditional tunes. Track 14 has as its second tune one of the most amazing arrangements of Old Joe Clark I have ever heard: I actually wanted to listen to this done to death tune for perhaps the first time ever, and the two Mandolin tunes he wrote (Track 12) are ones that also come to mind at the moment. Though a fully instrumental album may not appeal to all, I cannot see how anyone could fail to enjoy this album. The way he plays both on this CD and in general, his effortless open floating passages, fluidic playing and fretboard gymnastics leave me absolutely gob-smacked. He has a distinctive style that is so easily recognisable and when he plays you can hear that he makes every note count, singing with his guitar instead of his voice. The recording and production of this CD is truly excellent and makes a great CD even better, and I have to ask if you've ever wondered what justifies a Martin Guitar's price tag? Then just listen to how the 1930 OM18 he plays throughout the CD sounds, the playing and guitar are simply stunning. I can't categorise this CD nor would I like to, suffice to say I think it has something for everyone and it's really rather very good, and I am a master of understatement. I had to wait for two days to hear this CD from when I received it and the anticipation and waiting nearly killed me, and I can safely say it was well worth the wait. You really should go out right now and buy this CD, go on, right now, go now." produced a stylistically-varied and stunning bunch of tunes...In the company of long-time collaborator, harpist Máire Ní Chathasaigh and her sister, Nollaig Casey (incredible fiddler, but you knew that), he tackles many of own tunes and a couple of well-known ones. This lot ranges from flat-picked swing, through delicate airy picking and jolly mandolin to some ear-boggling, finger-tangling flat-picking on the challenging Scott Skinner medley. Having watched fiddlers struggle with Skinner's deliberately-difficult The Mathematician, it's a little depressing to hear Newman's apparently effortless guitar gallop through it, articulating each note with clarity and punch. In fact, this whole set's depressing - to hear someone play in as many different styles so well. Unusually for a largely self-penned set, this collection is heaving with good tunes - probably helped by Chris's own admission that he's not made a solo album since 1983, so there's 15 years of accumulated writing here! The UK has produced some staggering and influential acoustic guitarists in the past few decades - no sign of any let up here." TAPLAS "Chris Newmans third solo album, his first since 1983, is a veritable feast of immaculate guitar playing. Youre picked up with a racy bluegrass opener and straight into a ragtime blues. Then, just as you think youre in for fifty minutes of country folk, he unleashes The Riverside, a sweet track on classical guitar. Newman plays mandolin, piano and percussion, plus electric and fretless basses, as well as guitar, and is ably accompanied by long-time collaborator, Irish harpist Máire Ní Chathasaigh, who also adds whistle and piano, plus Nollaig Casey on fiddles. After only six tracks, it feels like an album full. Yet, there are seventeen slices of very rich guitar forest gateau to get through - a marvellous achievement. The moods change throughout, from the yearning and soulful Arctic Goose to the evocative Mediterranean-sounding Wheres the Bar? Newman adds detailed sleevenotes on all the tunes, almost all original compositions. Not a single word is uttered or sung throughout - a testament to Newmans ability to make the guitar grab your attention and never let you go. A great album from a respected and revered folk guitarist." FOLKWRITE "A neatly understated title! Chris Newman's first solo release since 1983 is, as anyone who has seen or heard him would expect, a dazzling display of guitar virtuosity. It's also a thoroughly tasteful and enjoyable varied affair, with Chris playing fingerstyle as well as the plectrum guitar for which he is better known, plus mandolin (accompanying himself from time to time on piano and bass). Chris's background in jazz and swing is evident in the pace and invention of his plectrum-work but, apart from in the breezy opening number and the title track - not in his choice of material. There's a Swedish Polska - Höök Olle Storpolska - two American reels (Tell Her Lies And Feed Her Candy and a gloriously ornamented Old Joe Clark), a set of Scott Skinner fiddle tunes (without a fiddle in evidence) - and the rest of the pieces are self-penned. Some pieces are almost classical in feel - aided at times by Nollaig Casey's multi-tracked violin. (Her sister, his regular musical partner, Máire Ní Chathasaigh, contributes occasional harp, piano and whistle). Elsewhere, Northumbrian, Scottish, Irish and American traditional influences are all apparent. The playing is, by turns, lively and reflective, energetic and expressive: the whole album is a delight." SHIRE FOLK "Most of the seventeen tracks are Chris's own compositions, consisting of variously employed flat and fingerpicked guitar, mandolin and electric or acoustic bass. Also appearing on some of the tracks are Máire Ní Chathasaigh (harp, piano and tin whistle) and Nollaig Casey (fiddle). The CD is full of wonderfully contrasting styles; from the very jazzy title track, Fretwork and Pass The Pick to the celtic-ish Astronomer's Gaze to the almost classical Mallard's Minuet. This is a recording of the highest quality, not just for the musicianship which is superb as might be expected, but also for the overall sense of freshness and drive which comes from the way in which the instruments have been arranged and mixed. It is also really nice to have details about keys and tunings in the sleeve notes. Even if I will never remotely be able to play any of it!" THE INVERNESS COURIER "The John Williams of folk guitar combines elements of Celtic, country and swing on his first solo album in 15 years - but its been well worth the wait. All three musical styles are seamlessly combined on Pass the Pick, the intricate lines of the title track are given a gentle rock beat, The Arctic Goose is a lovely slow air, marimba adds a tropical touch to The Last Call and the fingerpicking on a bluegrass medley takes the breath away. Whether double or triple tracked or with instrumental support from Máire Ní Chathasaigh on piano, harp and whistles and her sister, fiddler Nollaig Casey, Newman wears his virtuosity lightly and his music has immense vitality and charm." FYFE ON FOLK "Chris Newman has always remained one of my favourite guitarists. Where many would fall down at the first hurdle in a sterile performance, Chris breathes life and not a little lightheartedness that is often lacking in a technical virtuoso performance. Here, he also displays a real talent for mandolin and his subtle use of non intrusive percussion gives just the right groove for the Bossa Nova influenced title track which also features the harp of Máire Ní Chathasaigh in truly animated form. A resounding arena of applause for one of Britain's finest guitarists."